These roasted Brussels sprouts are so good, I have to stop myself from devouring the whole platter. They’re irresistible! While the recipe is simple enough to make on a weeknight, I hope they’ll also make an appearance at your Thanksgiving feast. 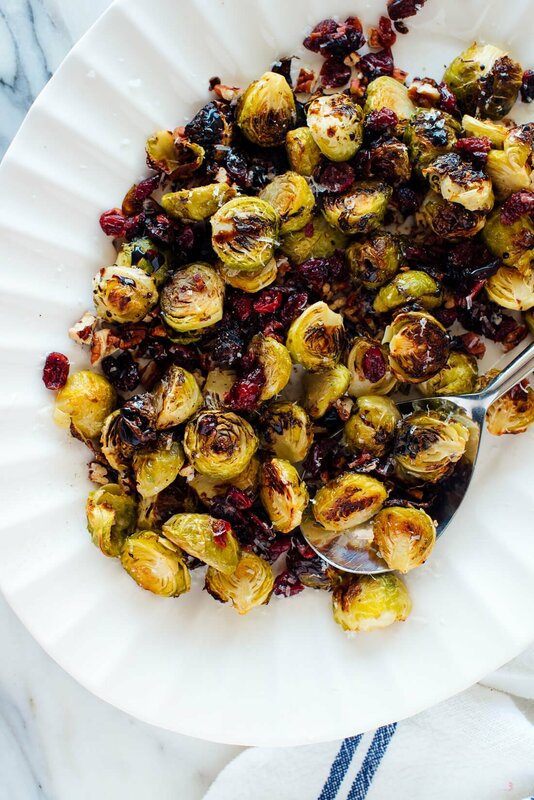 This festive side dish recipe features roasted Brussels sprouts, plump dried cranberries, toasted pecans and a drizzle of balsamic vinegar. I like to add some Parmesan cheese or a few little pats of butter for added richness. Have mercy. This recipe is famous in my boyfriend’s family. I haven’t had their version yet, but he got the recipe from his sister and I tinkered with it from there. The original recipe has pancetta in it, which I don’t eat, so I adjusted the ingredients and method and came up with this one. Part of the reason why I haven’t mentioned this great presence in my life is because the word “boyfriend” makes me cringe. What’s the grown-up alternative? Another reason is that I decided to stay quiet about my dating life after some heartbreak a few years ago. However, I met this man for spring rolls and beer one year ago today, and that seems worth mentioning. 1) Toss trimmed and halved Brussels sprouts in olive oil and salt, and arrange them with their flat sides down on the pan so they can get tender on the inside and crispy on the outside. 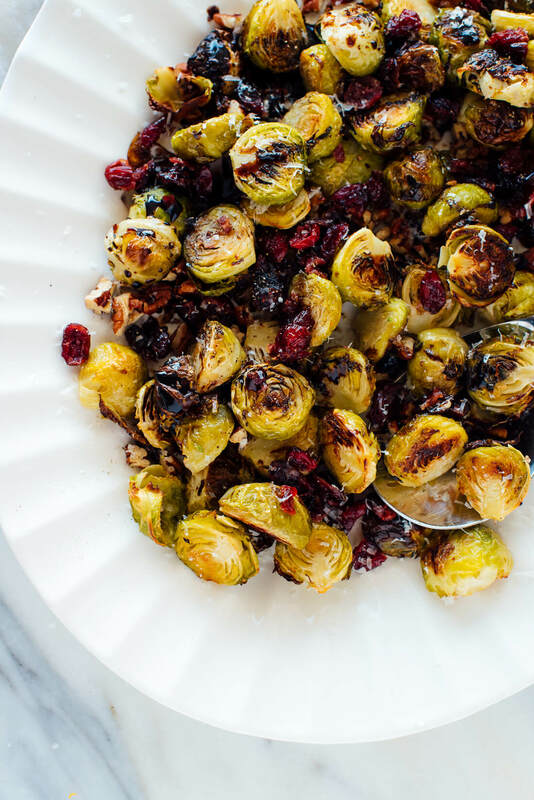 2) While the Brussels sprouts are in the oven, soak the dried cranberries in a bowl of warm water so they get nice and plump. 3) Toss the sprouts halfway through cooking, and when they’re almost done, sprinkle the pecans on top and return the pan to the oven. Now you’re roasting your sprouts and toasting your pecans at the same time! 4) Once the sprouts are out of the oven, transfer the sprouts and pecans to a serving platter. Drain the cranberries and sprinkle them on top. You’re almost done. 5) Drizzle good-quality balsamic vinegar on top, sprinkle with Parmesan or add a few little pats of butter (both optional, if you’re watching your dairy intake), and season with additional salt and pepper. Serve warm, or at room temperature. These sprouts are irresistible either way. 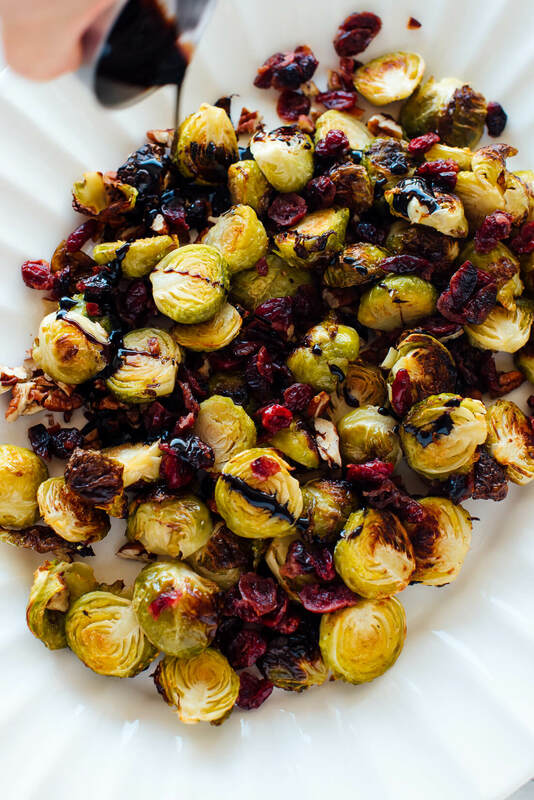 This recipe features roasted Brussels sprouts, pecans, cranberries, and a drizzle of balsamic vinegar. This simple side dish is utterly irresistible and perfect for the holidays! Recipe yields 4 to 6 side servings. Preheat the oven to 425 degrees Fahrenheit. Line a large, rimmed baking sheet with parchment paper for easy cleanup, if desired. To prepare your Brussels sprouts, trim the nubby ends and any discolored leaves off the Brussels sprouts, then cut the sprouts in halves lengthwise. On your prepared baking sheet, combine the halved sprouts, olive oil and salt. Toss until the sprouts are lightly and evenly coated. Arrange the sprouts in an even layer with their flat sides facing down. 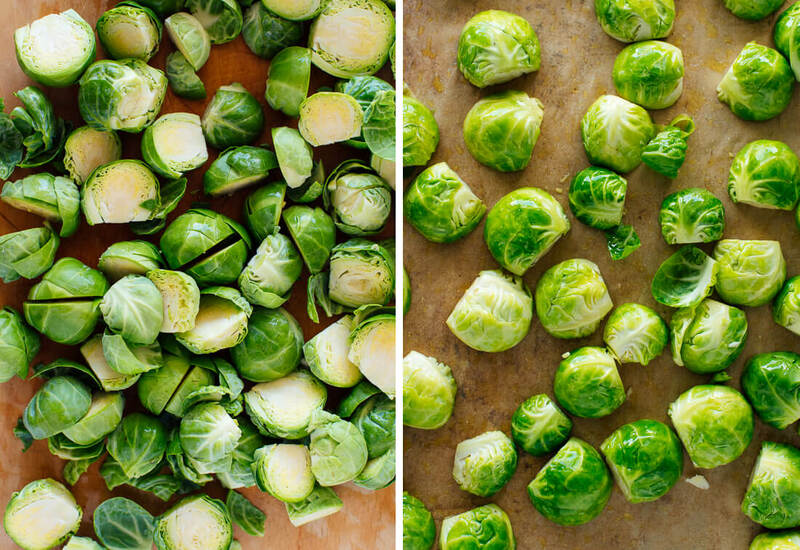 Roast the the sprouts until they are tender and deeply golden on the edges, tossing halfway, about 20 to 25 minutes. When they’re nearly done (about 3 to 5 minutes to go), add the pecans to the pan and return them to the oven (this is an easy way to toast the pecans). Meanwhile, place the cranberries in a small bowl and cover them with warm water. This will plump them up. Set them aside while the sprouts are in the oven. Transfer the roasted Brussels sprouts and toasted pecans to a serving platter or bowl. Drain the cranberries and sprinkle them on top. Drizzle the balsamic vinegar over the dish, then sprinkle with Parmesan and/or add the pats of butter for added richness. Season with salt and pepper, to taste. Serve warm or at room temperature (it’s great either way). This recipe is best when fresh, but leftovers will keep for two to three days in the refrigerator, covered. Gently reheat before serving. Make it dairy free/vegan: Simply omit the Parmesan/butter. Make it nut free: Replace the pecans with pepitas (green pumpkin seeds) or omit them. *Balsamic vinegar recommendation: Thick, high quality balsamic vinegar will yield the most beautiful and delicious results. I love Napa Valley Naturals’ Grand Reserve Vinegar—make sure you get the bottle with “25 stars” on it. It’s under $10 and typically available at Whole Foods and other health food stores. Cheers for keeping your personal life personal! Thank you, Alanna. :) I appreciate the support! So we just ate this in a restaurant in Connecticut over the weekend! Positive it was the same recipe. Amazingly good. Happy to hear that, AN! Just last night I was making a soup recipe of yours and wondering about your dating life! You are such a catch. This guy is lucky! Also, I can’t wait to make these! Won’t be waiting until Thanksgiving. You”re sweet, Faith! Thank you! I’m excited about this recipe. When asked what vegetable I should make for Thanksgiving this year, my husband replied,”roasted brussels sprouts.” I quickly reminded him that my every attempt at making brussels sprouts has failed. Now I have a recipe I can trust. Thank you!! I cannot do Balsamic vinegar. It literally chokes me. Is there another vinegar that I can use? Also congratulations on the man in your life. Hi Anna! I think these would still be lovely without the vinegar altogether. A spritz of lemon juice might be nice. How did you know?!! I had a version of this at a restaurant about a year ago and have never been able to recreate it to my satisfaction. I came to your site yesterday looking for a good roasted brussels recipe for Thanksgiving. And I printed one. But I will definitely be making THIS recipe. I already know it will be great. Also, congrats on your special someone, and I hope you have a lovely Thanksgiving! Great minds! Thank you :) He is pretty great! Read the baking instructions – line a baking sheet…what do you line it with? aluminum foil, parchment paper? What is best option? Oops! Parchment paper. I’m sorry for the confusion. Just fixed the recipe, thanks for your help! First, these Brussel sprouts look amazing – I can’t wait to try them! Second, before we were married I called my husband my partner. I’m with you on the ‘boyfriend’ thing – it made me feel like I was 15. Also, once we had been together for long enough (9 1/2 years when we got married) it just seemed silly. Congrats on the one year milestone! I waited well over a year after a long, failed relationship before announcing I had found a wonderful man. I usually use “significant other” or “partner” over “boyfriend”. Whoever he is, he’ll be having these brussel sprouts on Thanksgiving! Thank you, Shari! I love all the support I’ve been getting. You all are so sweet. Cannot wait to make this!! Let me know what you think, Bill! Looks perfect! Making this tonight. Will let you know how it turns out! Thanks for being such a lovely presence. You’re sweet! Let me know what you think. I’m glad I’m not alone, Charlotte! Looking forward to trying this- I love your recipe with the honey sesame glaze. Thank you so much for your recipes- my diet would be very different that’s for sure- just this week I have eaten your granola every day for breakfast (always keep a big bag in my freezer) your quesadillas, your pineapple fried rice, your chickpea masala…….so glad I found your site and your recipe book is getting a solid workout in my house. Thanks Kate. That’s awesome! Exciting C+K is on your menu so often. Thank you for sharing and your support, Rachel! 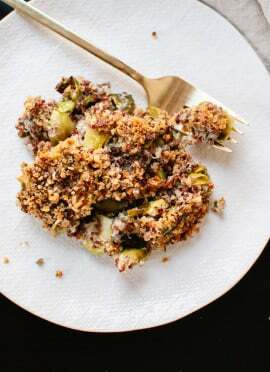 We are a Brussel sprout family so a new recipe is always welcomed! Our Thanksgiving has passed (we’re in Canada) but I will be sure to volunteer to bring this gem to our family gathering at Christmas. I’m very happy for you, by the way! He’s a lucky guy! This would be great for Christmas too! Thank you, Jocelyn. I feel you. I also find the word “boyfriend” to be cringe-worthy when I’m referring to my own dating life. It’s a nice milestone to acknowledge, though. :) This recipe looks simple and delicious–just how I like ’em! Feels good to know I’m not alone! Thank you, Katie. Be sure to report back once you have tried them. I do supply the nutritional information, it’s below the recipe! But, I’m glad you like the look of this recipe. Never mind! I found the Nutrient link. Hey! I’m definitely making this for thanksgiving this year, it looks so scrumptious and i’m not even a huge brussels fan. (gasp!) Just wondering how you would suggest I do that. Should I wait til the day of to put the balsamic and parmesan on it if I make it the night before? Since it is best served fresh, it would work fine to wait and add it after the dish has been rewarmed. Or reheat the entire dish, depending on your time. Either way. Thanks for the review, Rebecca! Made these the other night with some stuffed chicken and rice. It was delicious. Even the boyfriend enjoyed them. 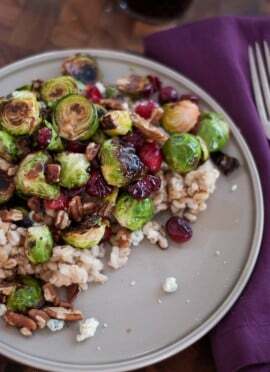 We enjoy roasted Brussels sprouts, but the addition of the walnuts, cranberries and balsamic vinegar was a nice change. Thank you for sharing! That’s great, Robin! Thanks so much for taking the time to comment. This recipe is a great combination of flavour and texture. Skip the parmesan and I like it even better. Love that, Ryan! Thanks so much. Can this be made the night before (I like to get as much done as possible)? If so, how would you recommend to reheat ? It is best served right away. But, you can reserve the sauce and add after when you are reheating, starting following steps 5 & 6. Hope this helps! I’m glad you love it, Emily! Test run is a great idea. Thanks for sharing! If I wanted to make this recipe with the pancetta, or bacon depending on what I can find, where in the recipe does it go, how much pancetta, etc.? Sorry, Kristen! I won’t be much help there since I don’t eat meat. Happy Thanksgiving! I made this for a friendsgiving potluck but we ended up not going. My husband and I ate it all in one sitting… it was that amazing haha. Love your recipes, thanks!! That’s awesome! I’m glad you both loved it so much. I appreciate the review, Alex! Do you think reducing the balsalmic vinegar to a thicker glaze would be good if your balsalmic is a thinner one? Your pictures look like its WAY thicker than my balsalmic. Hey Beth! Yes, I think that would be a good idea if you have the time. I mentioned my favorite balsamic brand in the recipe notes, if you are interested! Sorry for my delay! How did it turn out for you? Another question. Can i use a bottled balsamic glaze in place of the vinegar? 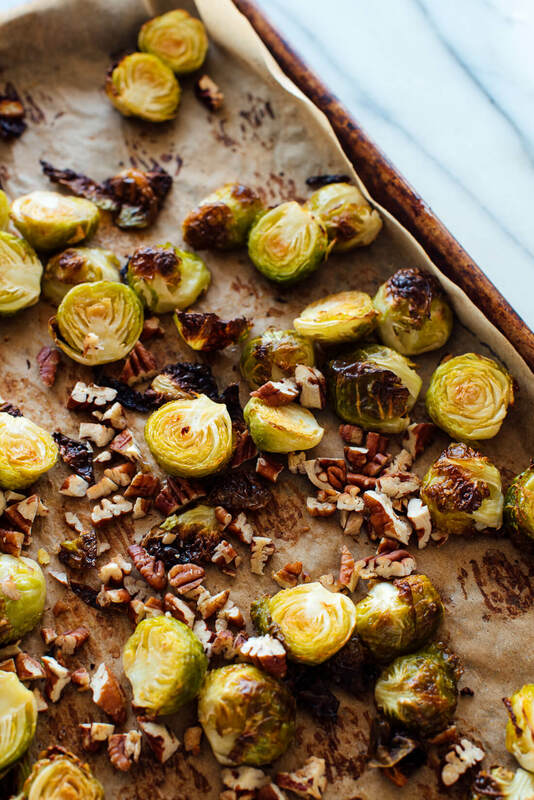 LOVE, LOVE, LOVE roasted brussels sprouts (and other veggies). I used a (store bought) balsamic glaze reduction. The taste was smoother than the bite you can get from plain balsamic vinegar. Did a trial run and it was so good I’m making it for Thanksgiving! Hi Kate! Do you have any advice for substituting fresh cranberries in this recipe? I have a whole bag in the fridge, ready for action! I’m not sure as I didn’t try it with this one. They might be too tart to balance the flavors. I made this for Thanksgiving dinner and it was excellent! I used Trader Joe’s basalmic glaze instead of basalmic vinegar (thought it might be a little milder) and it came out perfectly. I actually forgot to put the pecans in before the brussel sprouts were done, so I popped them into my convection oven real quick for a toast and added them in. The craisins and pecans added a great flavor. I will be making this again! Sorry, just want to be sure I understand correctly; when you say “tossing halfway, about 20 to 25 minutes” does that mean 20 – 25 minutes is the halfway point or the total roasting time? Sounds great! Can’t wait to try them. Toss half way, so bewteen 10-12.5 min. 20-25 is the full cooking time. I hope this helps! Winner winner sprouts for dinner! 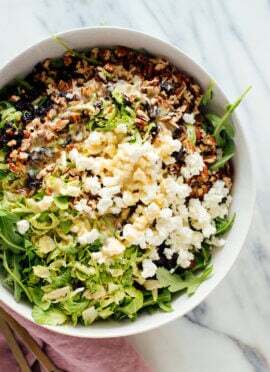 My husband and I are wild about Brussels Sprouts, and we LOVED this recipe for them – and even my 15 year-old gobbled it down. I let them add the Parmesan after the fact, but dairy-free me is fine with a little extra balsamic and vegan parm. Love that, Da! Thanks for sharing. LOVE this recipe! Made it for Thanksgiving and it was a hit. My balsamic was thinner than yours, so I made a balsamic reduction, and tossed in “just a little” brown sugar I had on hand to mellow out the reduction. A great combo of flavors – especially adding in the craisins. Thanks for your review, Diana! On Thanksgiving Eve, we seemed to be missing a green vegetable. I had one of those giant stalks of brussels sprouts from Trader Joe’s so I consulted with my mom and we decided to make your recipe. And they are amazing! So simple and so good. I will make this recipe again and again. Another winner Kate! I’m glad you made it! Thanks, Sera! This recipe was great. My 12 year old son loved it – even reheated it the next night and he wiped his plate clean! Usually so hard to get the kids to eat their veggies :). Thanks for great recipes! You’re welcome! I’m glad you son liked it too, Jill. I’m really glad I’m not alone! Thanks, Cyd! SO good. 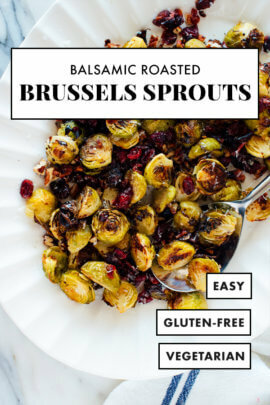 I generally don’t like brussel sprouts, but this, along with the simple recipe and ingredients (all of which I had in my kitchen!) was delicious! Definitely a keeper!! I’m really happy to hear that, Carol! Thanks for sharing. Roasted brussels sprouts are great with just salt and pepper, but adding the pecans, craisins and balsamic vinegar take these up another level! I made these tonight, and they were (past tense since they all disappeared!) delicious! Another spin on the word “boyfriend” – I call my husband boyfriend so I don’t take him for granted. Thanks for a great recipe, and for sharing part of yourself. I know, right! So delicious. I’m happy you agree. Thank so much for your feedback, Connie. Ugh I agree – so don’t like the word “boyfriend.” I feel like there is no enjoyable alternative word for unmarried adults! Thanks you, Jenny! I’ve been happy to hear I’m not alone in that feeling. Very good! I finished it with a sprinkle of Parmesan. A really nice side dish for our fish main. Thanks for sharing, Rachel! I appreciate the review. Made these tonight. My whole family—including all 3 kids, ages 9, 6 & 4–really like Brussels sprouts just roasted with garlic cloves or sweet potatoes and lightly seasoned with salt & pepper. So your recipe is a welcomed variation with a sweet and tangy twist! I used what I had on hand, so I subbed cashews, since organic pecans are much more expensive and harder to come by (up here in MN anyway), half raisins and half goji berries, and apple cider vinegar (ACV) since we don’t keep balsamic around because we love all of the added health benefits of unfiltered, unpasteurized ACV “with mother.” Very tasty even with all of my tinkering—I love flexible recipes! Thanks so much for sharing this, and vegetarian recipes in general, with the world! I love your entire family loves them! I’m glad provided some variety. Thanks for your review! This turned out soooooo delicious!!! My daughter and I absolutely loved it. I used a balsamic vinegar glaze and it worked perfectly. Thank you for sharing, Julie!